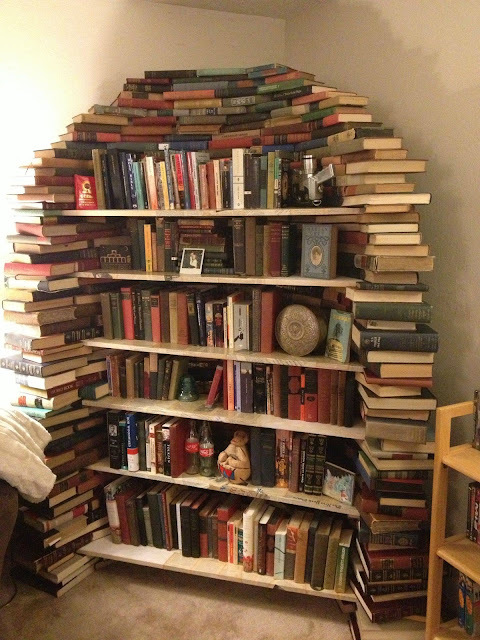 American photographer Thomas R Schiff uses a panoramic camera to capture epic pictures of libraries across the US. 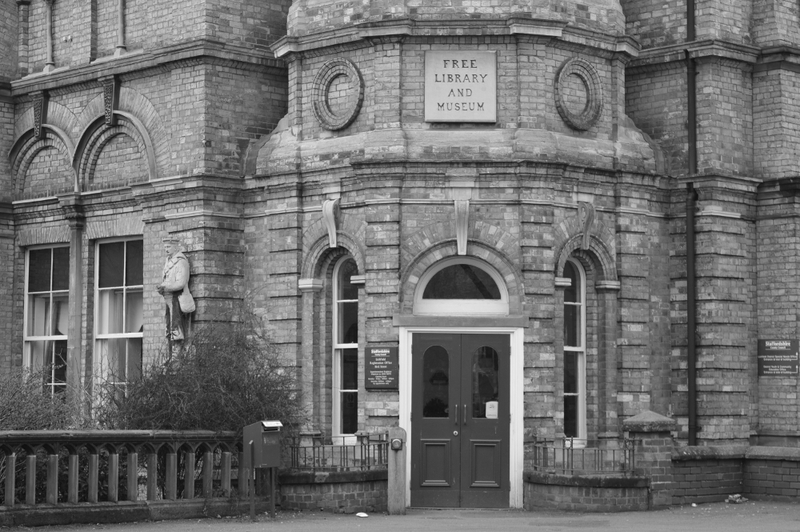 The Library Book, published by Aperture, features buildings across the country from the earliest institutions to modernist architecture, tracing the evolution of the library as central to American culture. It is accompanied by an exhibition at the Aperture Foundation in New York City until 20 April. Located in a converted warehouse in downtown Calgary, the client’s loft had an unused space that was once part of the building’s industrial elevator shaft. Taking advantage of the room’s high ceilings and small footprint, the space was adapted into a climbable library and music studio. 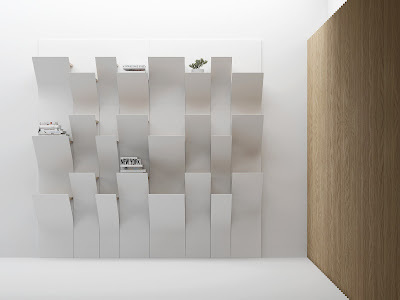 The verticality of the room prompted the design of a climbable shelving system that playfully and efficiently uses minimal floor area while providing ample storage and display space. 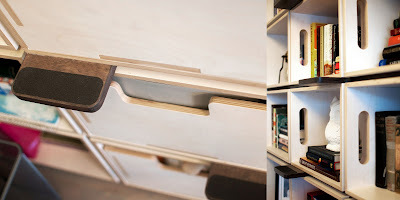 The millwork wall has handholds and foot tabs integrated into the structure to facilitate climbing and make fetching a book fun. 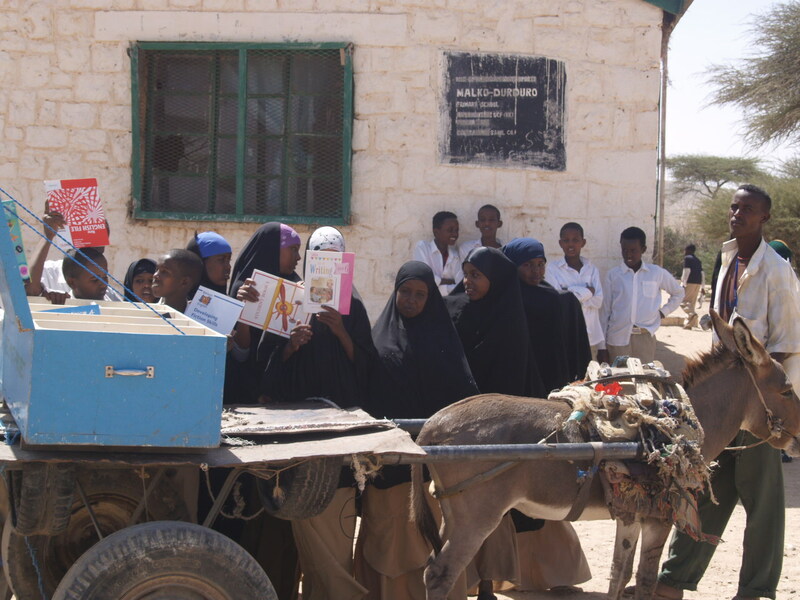 Africa Educational Trust is looking to raise £3,000 to allow them to transport 10,000 books donated by Book Aid to 66 libraries, including Donkey Drawn Libraries, across Somalia. 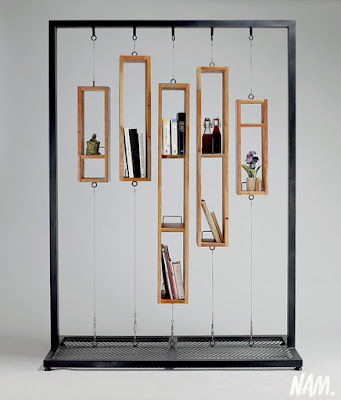 Steel and wood and fixed wire in frame. Hoja is a bookcase in poplar plywood that allows you to hold about 40 books in a small space. 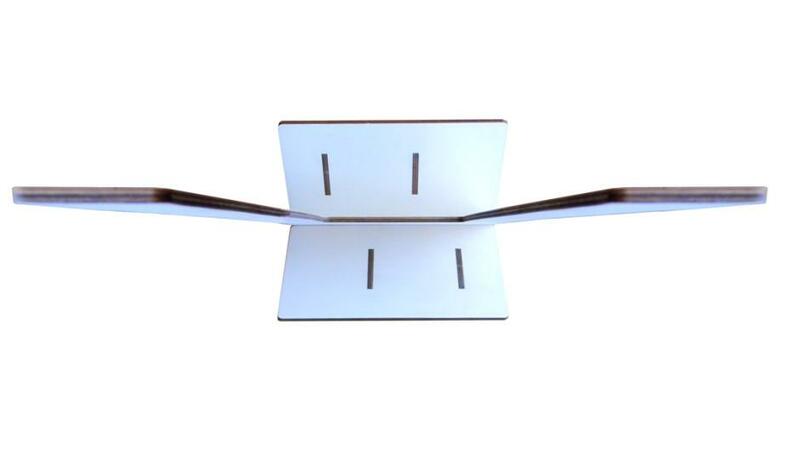 The product dimensions are 255x225x790 mm​​. The object is assembled without screws or bolts, you'll only need a hammer to fix the joints. Sitting With Jane is a unique public art trail to celebrate Jane Austen’s connections with Basingstoke and her birthplace, Steventon, and forms part of a global commemoration of her life in 2017, the 200th anniversary of her death. Sitting with Jane is a public art trail made up of 24 ‘BookBenches’ in and around Basingstoke, each uniquely designed and painted by a professional artist with their personal interpretation of a Jane Austen theme. The trail will link together locations – all with free public access. It will be in place between June and September j2017 and will be accompanied by a free to download app and a trail guide. After, the benches will all be auctioned in aid of Ark Cancer Centre Charity,to leave a valuable lasting legacy in the region. Sitting With Jane is part of the Hampshire Cultural Trust’s celebration of Jane Austen’s life in Hampshire. 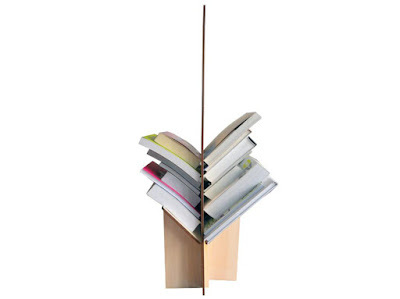 Chinese cultural thinking appreciates the smell of books as an expression of respect for knowledge. 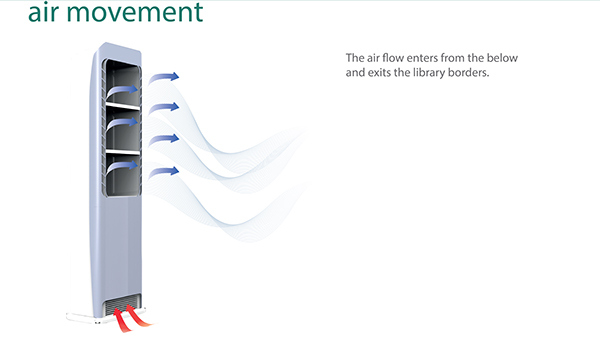 It is a harmonic relation between a library and airflow. 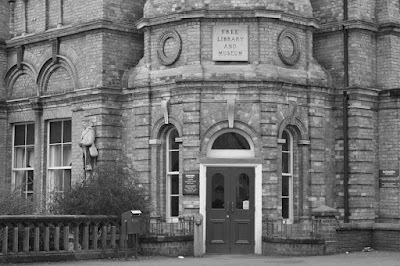 As we continue to fight to save our local public library which turned 80 years old last week, I’ve been thinking a lot about the lifecycle of libraries and how they change over time, and what happens when they’re gone. 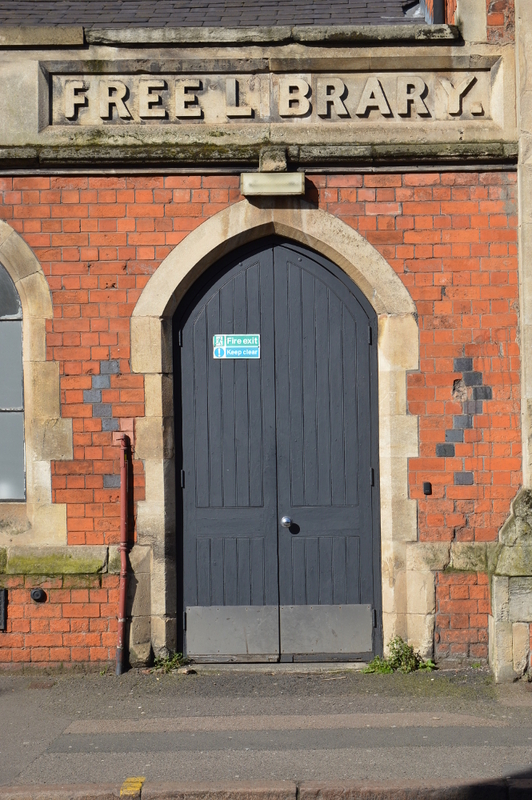 Among other things, this has led me to visit several “ghost” libraries – buildings originally built as libraries, but which no longer house libraries, either because they’ve been moved to new buildings or simply because the library has been closed and lost entirely to its community. Hunting for these “ghosts” has been meditative and moving. 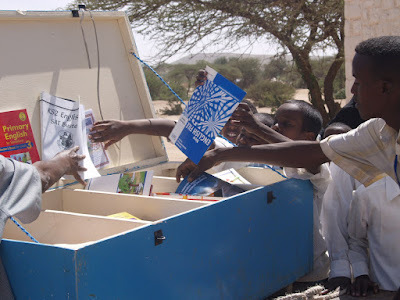 I can’t help but wonder what books were read and borrowed, what lives were changed as a result of these former libraries. 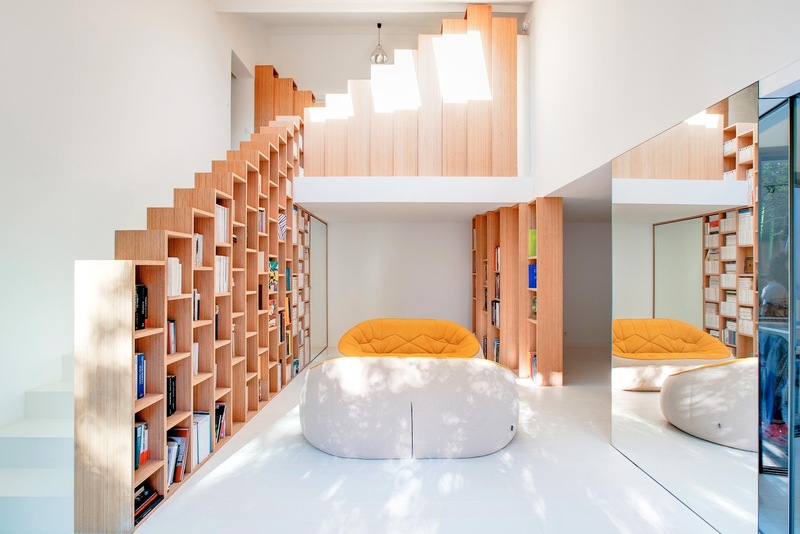 Stepped bookshelves help to divide and characterise this house just outside of Paris. 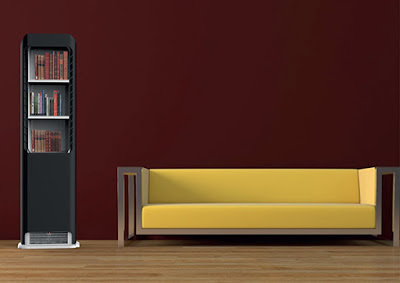 We designed the interior for a family of five, who were enamoured with the room-length bookshelf at a friend’s house, where they were staying during the remodelling. 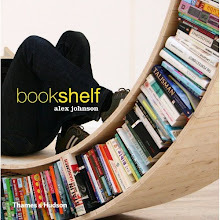 We made the element a feature of the home, which we called Bookshelf House. As well as providing a place to display books, the beech wood shelves act as stair bannisters room dividers and general storage within the three-storey property. Rather than flat shelves, we designed the bookcases to look like stacked boxes. 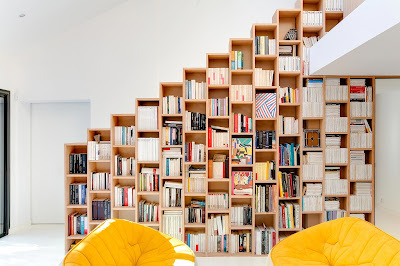 The largest unit extends from the first floor to the mezzanine, serving as the main bookshelf in the living room as well as a bannister on one side of the stairs. Its stepped top continues on the mezzanine level, where it serves as a storage cabinet. 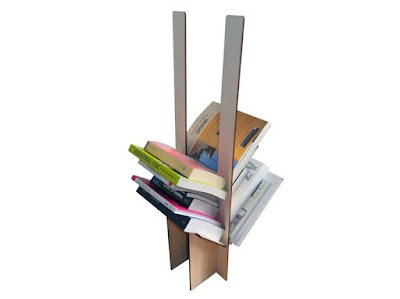 The main shelf is reflected by a large mirror on the opposite side of the living room, making books a dominant feature of the space from almost any angle. The Home Café chain incorporates various concept versions to offer spaces to breathe in heavily polluted areas of China. 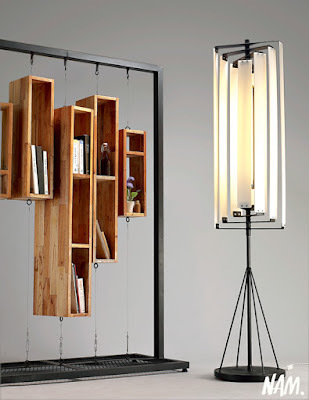 Steel bars are upcycled to become a main interior design feature. The steel bars create a series of cubic frameworks, which can be combined to shelves of different sizes. 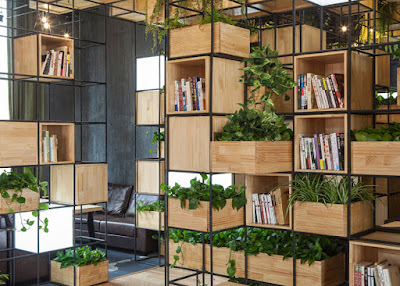 Boxes of plants, books, and lights on different levels create various densities for the interior. Flexile is a flat-pack bookshelf which utilizes polyester textile for personalization. 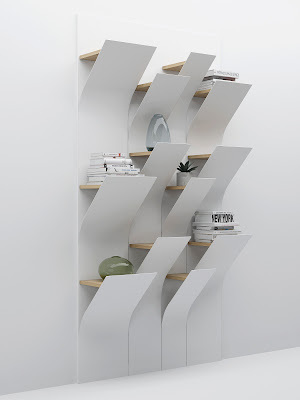 Flexile can be mounted in as many different ways as the user imagines.